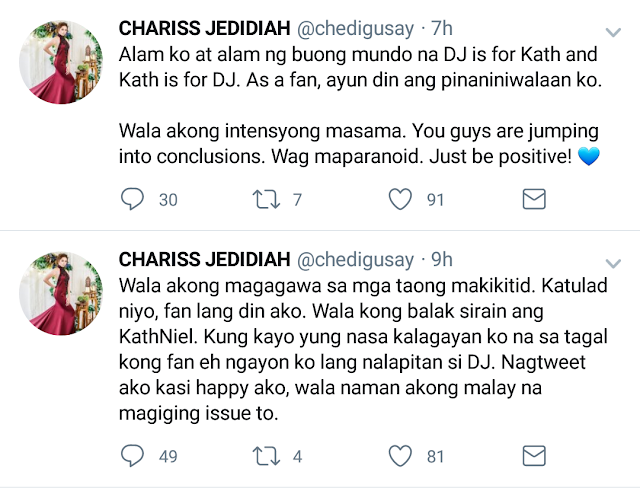 Amidst the rumored break up issue that has been circulating between Kathryn Bernardo and Daniel Padilla, fans remain optimistic. 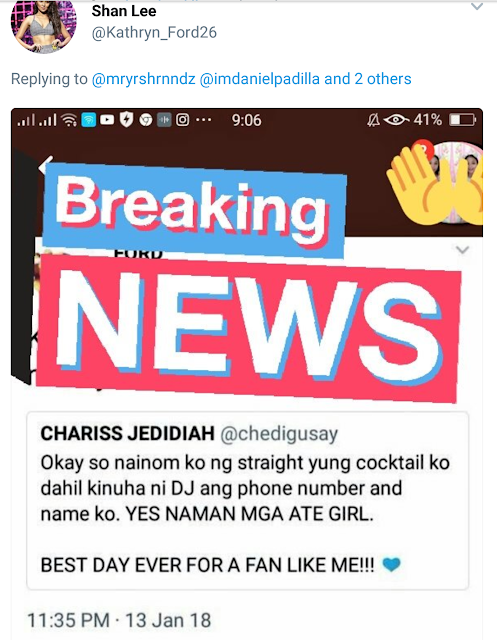 However, Kathniel fans aren't happy about a fangirl Chariss Jedidiah 's tweet saying Daniel Padilla asked for her number. 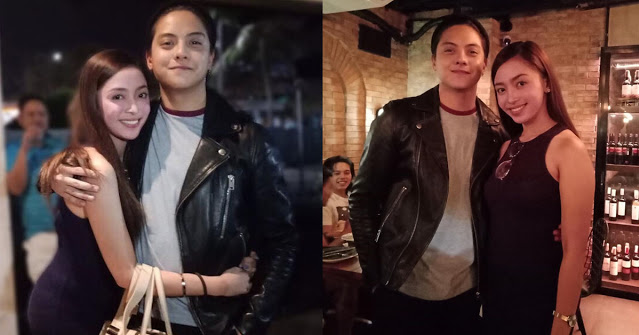 Chariss can't help but to expressed her happiness to her Instagram story when she met Daniel Padilla in a certain place. "I've been an avid fangirl of Daniel Padilla since I was in 6th grade I think? And since then, I've been following him in all his events such as mall shows, tapings, concerts etc.but I never had the chance to see him up close. I never had a single photo with him," she wrote. "It's definitely a dream come true for a fangirl like me to be able to be with him in one place, to have a chance to chat with him for a while, to hug, shake & "beso" with him, and of course, to be able to take cute photos and videos with him. "At first I felt so shy, I gathered all the strength I had (as my face turns red bc I always blush) to go near him. He even initiated to get my bag and place it in his chair when he felt that I'm feeling a bit awkward and nervous." She added. Gurl why do you act like your the victim? Eh ikaw nag tweet ng mga ganyan then you dont have any proof pa kathniels only want to know the truth. However, Jedidiah respond and explained to everyone about her clean intentions and nothing more.